Summer is all about sauces made with fresh tomatoes and almost nothing else. At a trip to the farmers market with a friend we stumbled upon the most beautiful (and pesticide free) tomatoes as well as live basil plants that were fragrant enough to smell from several feet away. In my book, that’s just asking to be made into pasta sauce and nothing else. So we scooped up more tomatoes than we probably should have and hopped on home to cook them up. Did you know that smell is the strongest trigger of memory? As the sauce was cooking and the smell started to waft through the kitchen, I instantly realized that this is basically the same recipe that my mom likes to make whenever we’re abroad in Turkey. 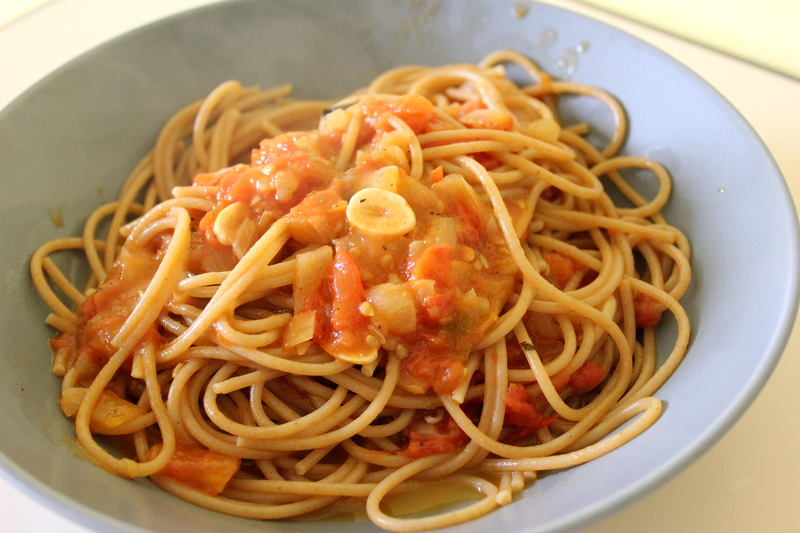 While she uses garlic only and no onion, the premise is the same – a dash of olive oil, fresh tomato, salt, pepper and some pasta. Just smelling it in my little kitchen triggered an instant memory of good times in summers past. Regardless, this summer is shaping up to look like an excellent one as well, tomatoes and all. I like to make a bit of basil oil to drizzle on the pasta at the end, but it’s also useful for roasted vegetables, salads, and almost anything else you can dream up. If you don’t have fresh basil for the sauce, use dried instead. 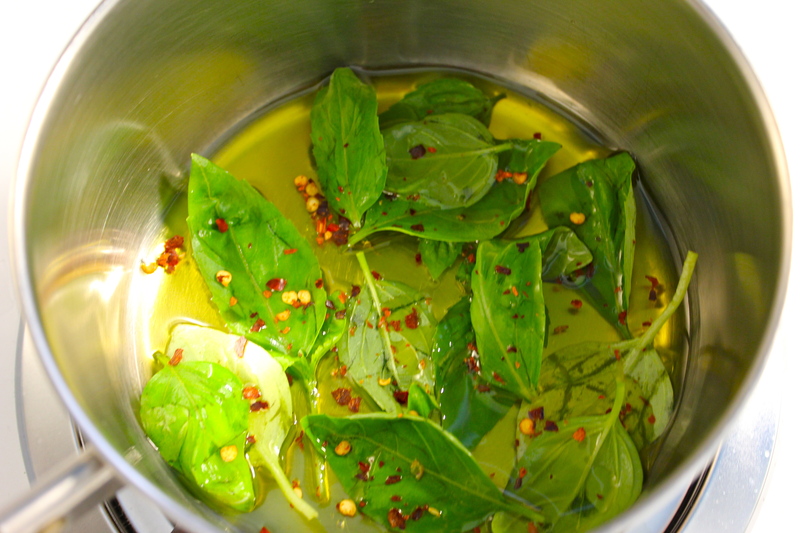 The basil oil, however, requires fresh basil. If you must, use canned tomatoes instead of fresh, but the joy of this sauce really comes from the fact that the tomatoes aren’t canned. 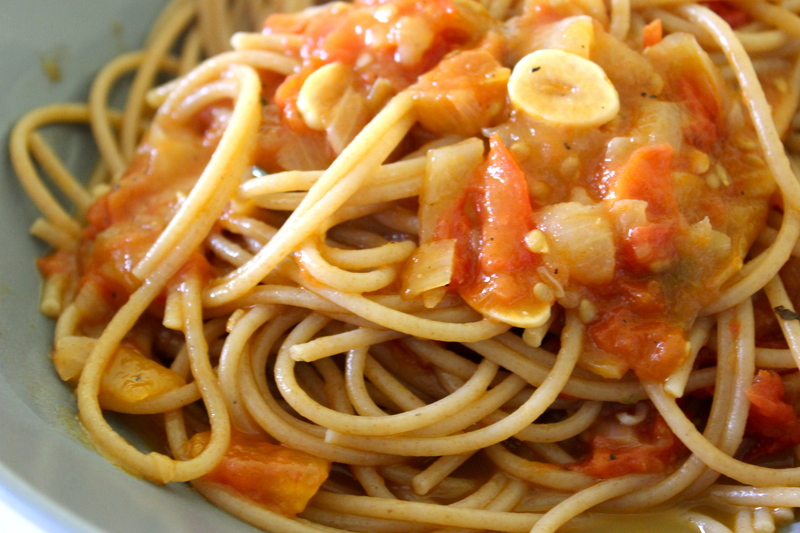 If you want a red sauce recipe with canned tomatoes try this. 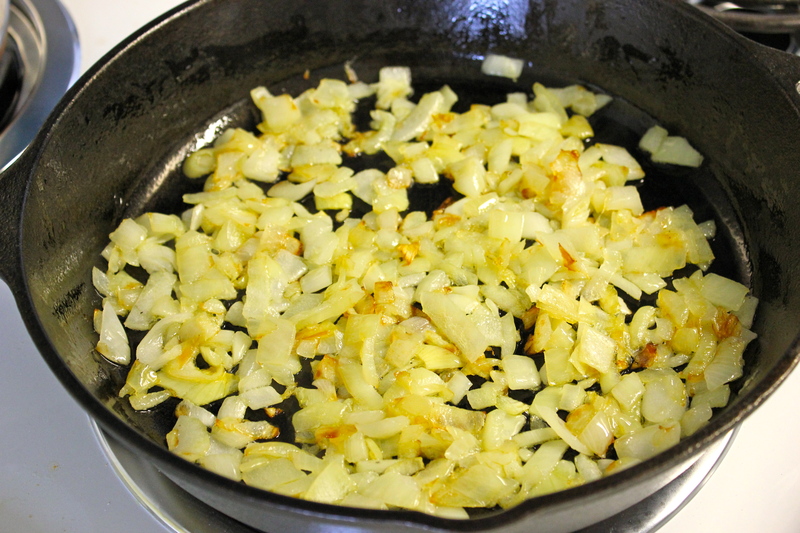 Add olive oil to a large pan or pot and bring to medium low heat. Dice your onion and add. 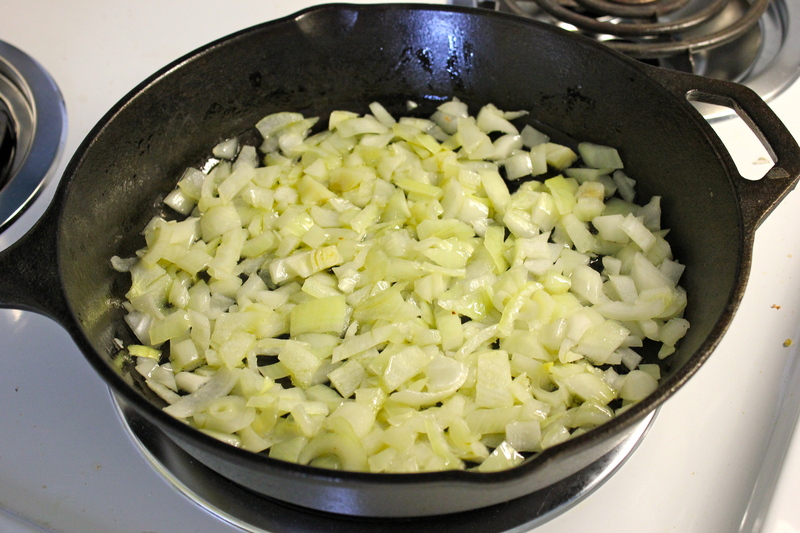 Let onions cook until just caramelized (lightly browned) but not burned. 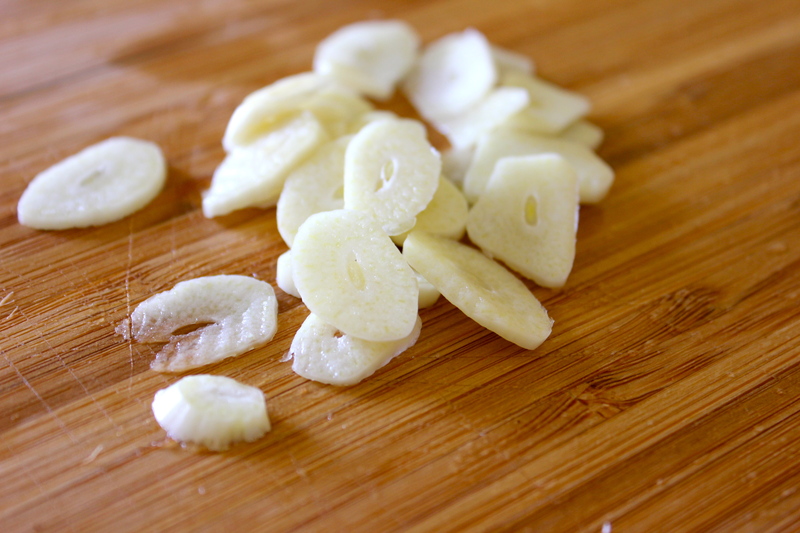 Once they are cooked, slice your garlic into thin rounds and add. 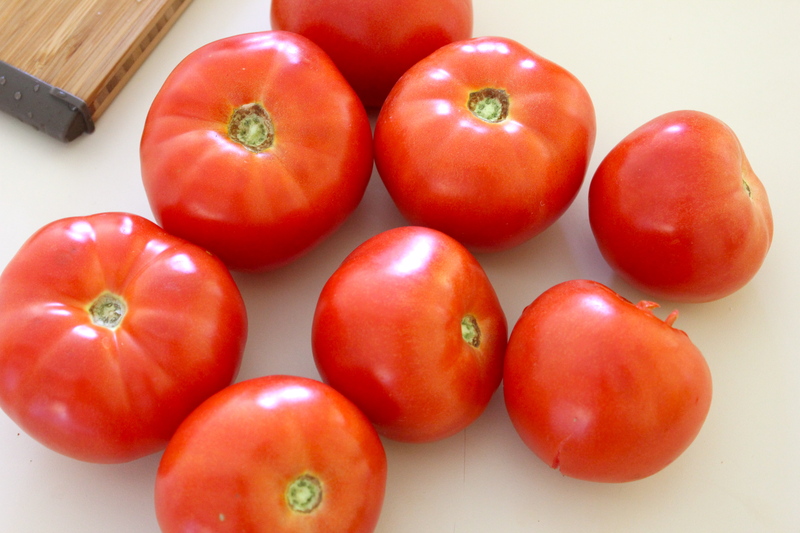 While that is cooking, wash and dice your tomatoes. Add immediately. Mix well and bring to a simmer. 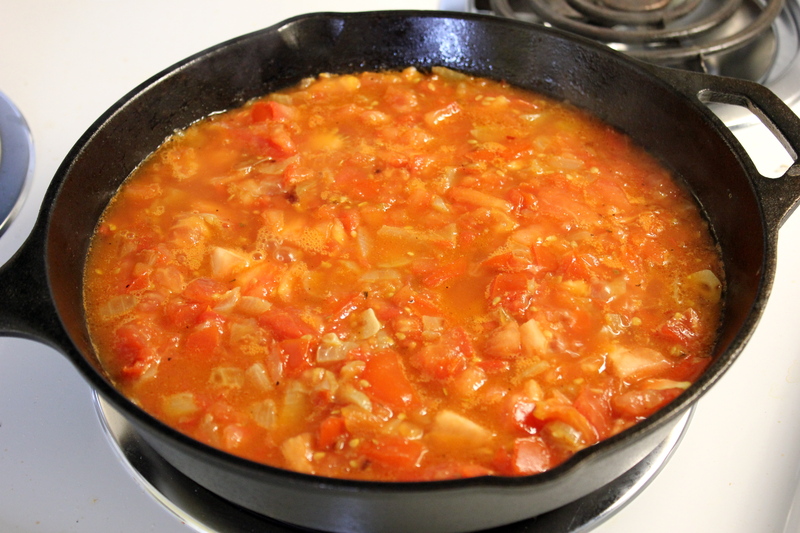 Let cook for at least 20 minutes or until tomatoes are well broken down. Taste and add as much salt and pepper as needed. Wash your basil leaves and throw them in whole, mix. Bring a medium pot of water to a boil and add a generous pinch of salt. Cook pasta for 1-2 minutes shy of the package directions. It should be firm but not fully cooked. 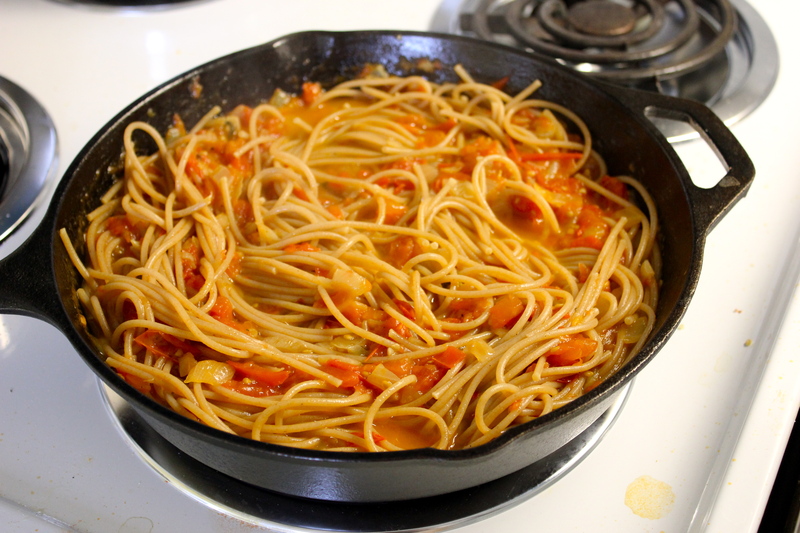 Then, drain pasta (reserving about 1/2 cup of the pasta water) and add directly to the sauce. 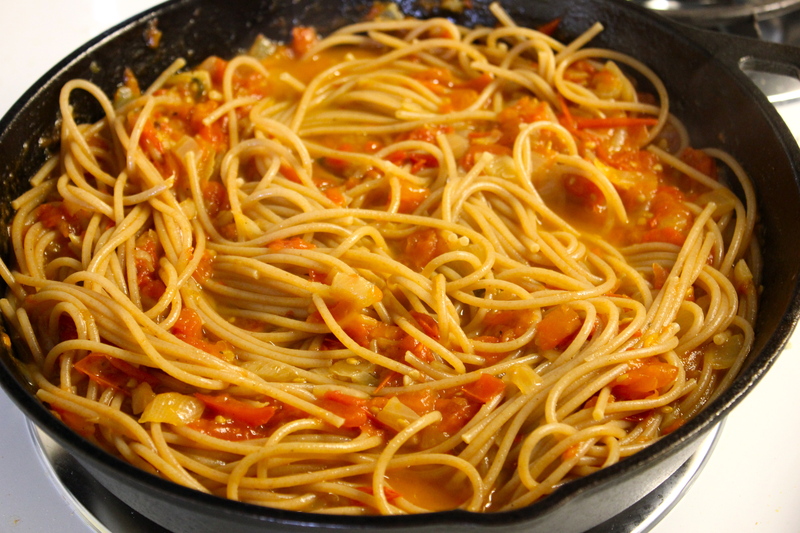 Add the pasta water to the sauce and mix well. Bring to a gentle simmer and let cook for 2-3 minutes until noodles are fully al dente (or even softer, depending on how you like them). Serve with a drizzle of basil oil and some parmesan cheese on top. 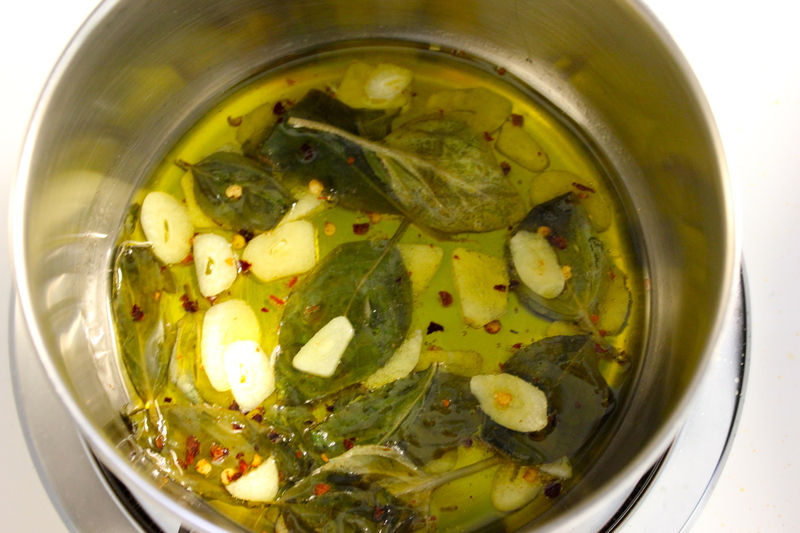 Add olive oil to a small pot. 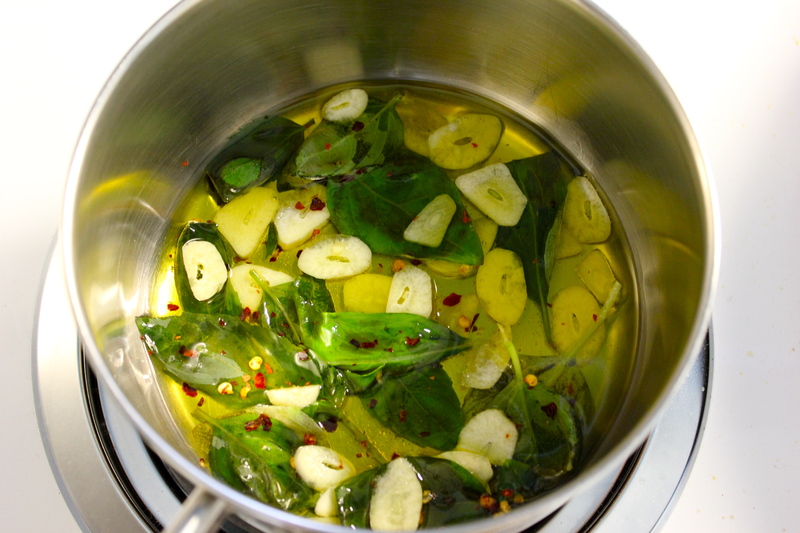 Wash basil leaves, dry and add to the oil. Cut garlic into small rounds and add to oil with red pepper flakes. Set your stove to the lowest possible heat. 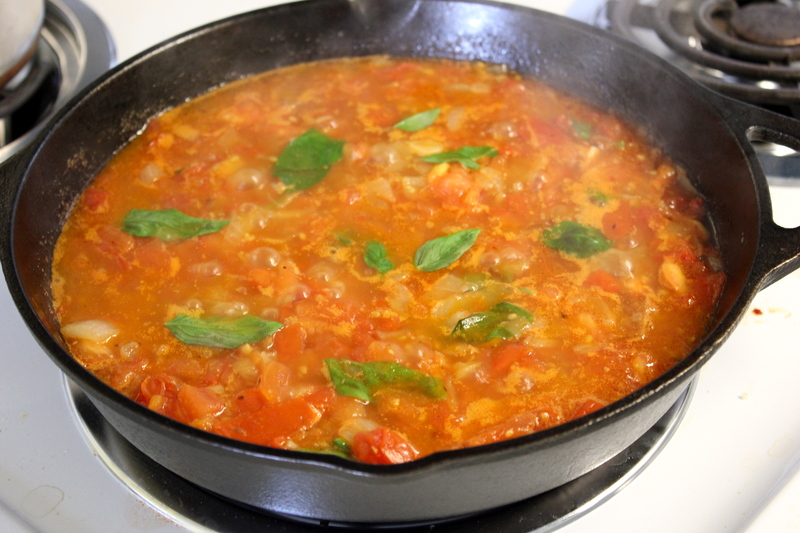 Allow to sit for the whole duration of cooking the tomato sauce (the longer, the better). 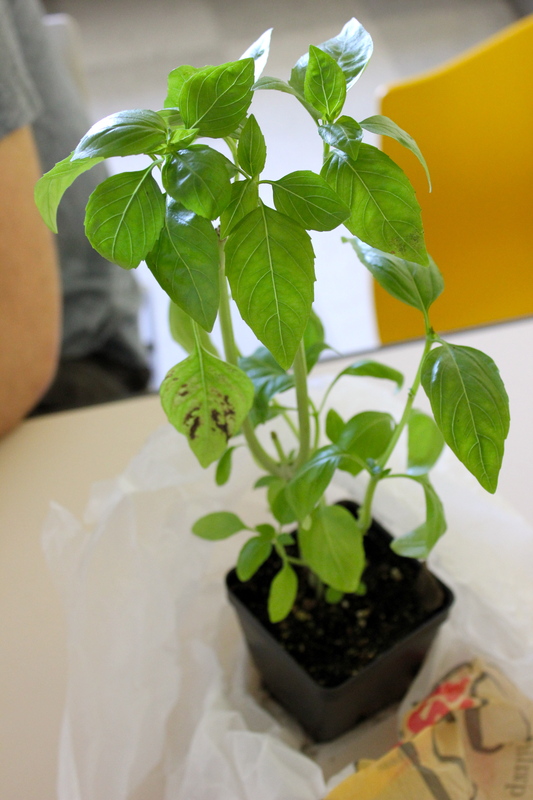 The basil leaves should turn slightly darker in color but should not fully cook. 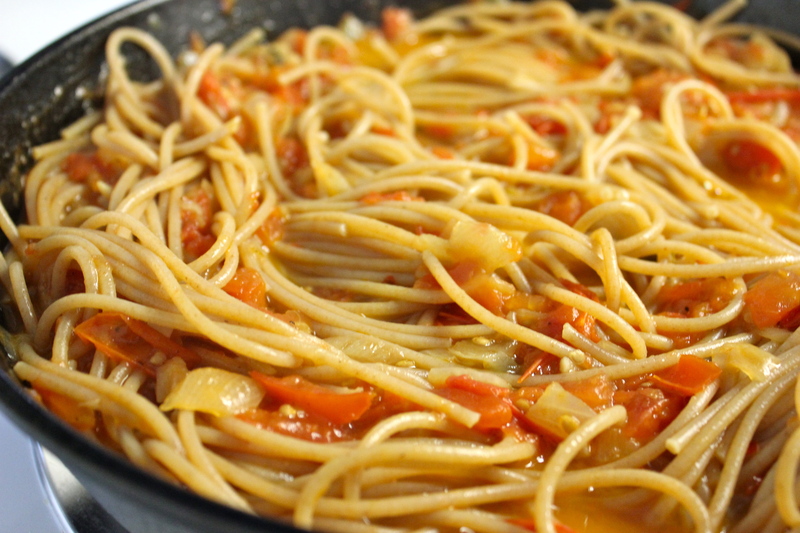 Drizzle oil on pasta or serve with bread on the side. You can save extra oil in a Tupperware with the basil and garlic to keep soaking up the flavors.